This post is inspired by my day job and also a blog post I came across. 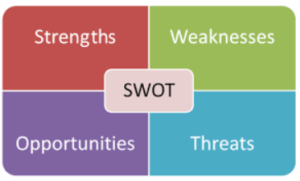 By day I am a full time digital marketer and one of the market analysis that I have completed is a SWOT analysis. Investopedia has a good overview of what this is in the context of why a company would complete such an analysis. I also know of entrepreneurs who want to start a business and end up completing a SWOT market analysis as part of their business plan. Cash Money Life took the SWOT analysis a bit further and added the financial spin to it. Here is my first attempt at my Financial SWOT analysis. My financial mission statement – I am currently in my mid 30s and I started this financial journey very late in my late 20s. 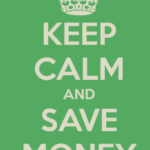 It was not until a few months ago this year, I set to change my financial mindset. I aim to retire by age 55. I currently make 6 figures and am very satisfied in my current full time role as a VP, Digital Marketing at a Fortune 500. My role allows me to continue learning and make a difference in the company. More importantly I see what my parents go through still to this day struggling financially and having no retirement savings let alone any emergency savings. They work too hard to scrape by and I help my parents financially every month. My retirement will not only cover myself, but I hope my finances covers my parents. Helpful questions: What are the strong areas of your finances? Do you have a positive monthly cash flow? Are you paying extra on your debts? Are you debt free? Did your income recently increase? My financial strength is that I have a full time job making 6 figures. 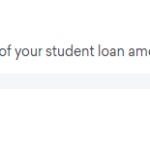 I have a large $34K student loan debt, but I am paying extra per month. I currently pay $2,000 per month and hope to increase my monthly payment starting this month (July 2018) so I can pay off my student loan debt in less than 1 year (aggressive target of 6 months). I am also looking to make extra income and take side hustling more seriously. Ask yourself these, and similar questions: Have you maxed out your income potential in your current job? Are you in debt? Are you upside down on a car or house loan? Are you living paycheck to paycheck? I have a lot of student loan debt. I also leased a new car recently so I still have a couple more years. After my car lease contract ends, I will be buying the car. I have credit card debt, but I pay off my balance in full every month. I will most likely get into another massive student loan debt within the next 6 months because I plan to enroll in a part time MBA program. My company pays for the bulk, but not enough to cover the entire cost. I also plan to buy my first single family home as an investment property. I will live in the property for at least a year to take advantage of the best mortgage rates, remodel while I live there, and then flip (or rent as a last resort). Opportunities are actions that you haven’t yet taken, or at least haven’t yet maximized. There are almost always opportunities if you look for them, though sometimes they may not appear evident at first glance. 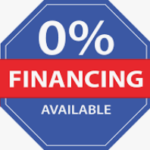 Financial opportunities come in many flavors, including income opportunities, debt reduction, investments, reducing interest or fees, and more. I make a good annual salary with expectations of a small raise every year (to keep up with inflation of 2-3%) and I also get an annual bonus. There is opportunity for me to get to a higher VP level to increase my salary a bit more. I need to take my side hustles more seriously. I expect my buying and selling sports cards side business will increase after August after the biggest sports card show takes place. I have been exploring taking surveys and mystery shopping. External factors to consider: Are you in danger of losing your job? Is your mortgage rate about to reset to a higher APR? What are the current economic factors that may affect your job/investments/income streams? There are always unexpected expenses and life situations. My job is currently secure, but you never know with anything in life. I have an emergency fund to cover these situations and my parents live in the same state if the worst comes to worst. My biggest foreseeable threat is with real estate. When I buy my first property hopefully this year, I have heard and read from various real estate podcast and blogs that every single real estate investor experiences bad deals and bad situations. Most of the time this involves either overpaying or unforeseen circumstances while remodeling. I have been researching and checking out properties to continue learning. I have been rejected on my offers a dozen times because I realize I must be patient. What does your financial SWOT look like? Post on your blog and comment here with the link. I would like to include a running list of financial SWOT analysis. I think it will help readers see different SWOTs.